Growth has come to a halt. Were getting very close. In fact, I expected to come in this morning and find it opened over night. The picture above was taken at 8:00 AM this morning and I just went out (1:00 PM) to see if theres any change but not yet. 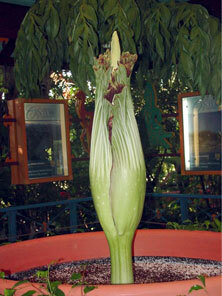 The edge of the spathe continues to color up and could completely fill in before the opening. Last years blooming produced a spathe that still had some green around the edges when it opened. This plant is a sibling of last years titan so it could stand to reason that this spathe may not color up all the way. However, Ive been fortunate to see a number of other titan blooms that are also siblings of this plant and they had the beautiful maroon coloration throughout the spathe. Either way it will be spectacular.